enhancing your horse’s health and performance. HAYGAIN Hay Steamer , its unique method enables steam to penetrate the centre of the hay and diffuse outwards ensuring even steaming throughout. 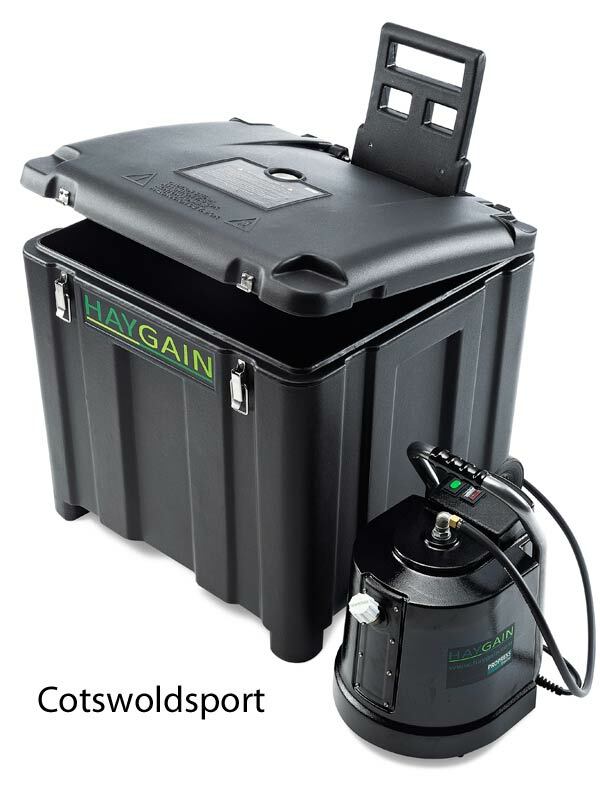 The unit is designed to maintain the high temperatures critical to kill all harmful fungal spores (and other living organisms such as mites), effectively sterilizing whilst maintaining the hay's nutritional value, resulting in a totally dust and spore free palatable forage. So simple and easy to use...fill up the independent steam boiler with tap water, which rapidly generates steam. Place hay onto the manifold spikes within the HAYGAIN Hay Steamer. Steam travels through the unique aluminium pressure die cast steam distribution manifold and steams outwards throughout the hay ensuring total absorption. The patented design ensures introduction of steam to the bale in the most effective manner. The spikes of the manifold penetrate the bale and release steam, enabling it to diffuse outwards from the centre of the bale. 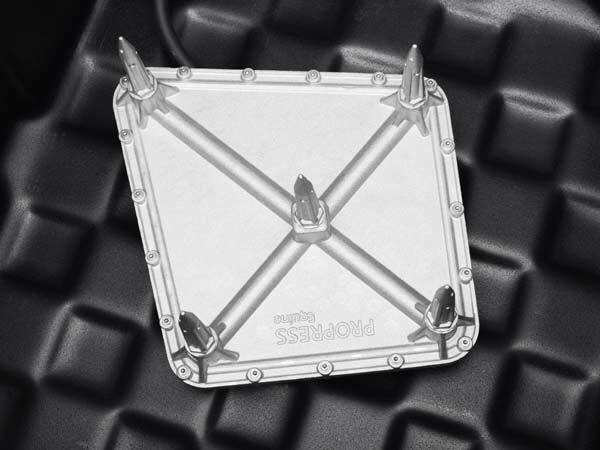 The container is fully insulated and sealed, ensuring the critically necessary temperatures are maintained. As the moisture content within the hay increases, the temperature rises exponentially due to the increased efficiency of condensed steam acting as a heat conductor. The temperature of the hay reaches temperatures necessary to guarantee that the mould spores are completely killed and irrespirable, thus posing zero risk to the horse and handler. The unit is a joy to use and we find our horses love the treated hay and previous animals who were prone to coughing are now totally clear. How do we make the steam? 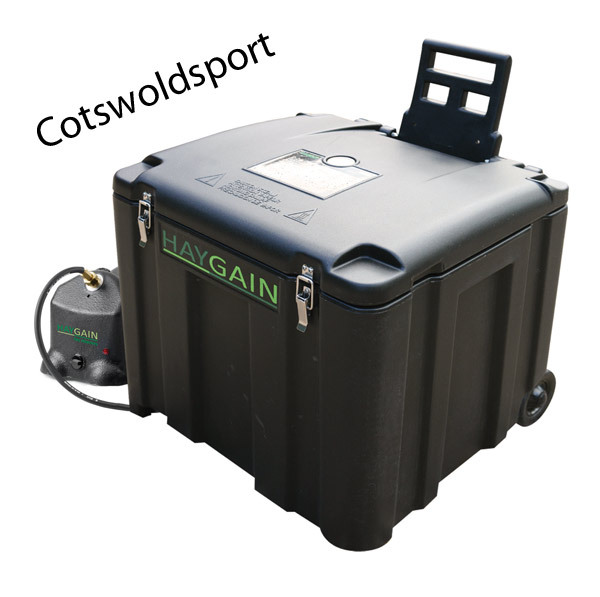 HAYGAIN Hay Steamer comes with a robust steam generator having a capacity of 7.5 litres this enables two steaming cycles depending on the density of the bales. Again, there is no compromise, endorsing the PROPRESS commitment to building renowned Great British quality products. Please email sales@cotswoldsport.co.uk for shipping quotation to other countries, standard UK main land only is shown.